"It’s a Tide ad" by Saatchi & Saatchi ran during Super Bowl 2018 and starred Stranger Things actor Jim Hopper as an omniscient narrator hijacking other ads during the game. During the Super Bowl, millions of viewers go online to comment on and scrutinize every ad of the broadcast. To own the social conversation, we found something all ads have in common, and gave people a filter through which they could judge every ad they saw: the presence of clean clothes. With the unexpected appearance of David Harbour hijacking different commercials, we kept the Internet guessing. People talked and laughed about laundry, questioning many of the commercials as to whether they were #TideAds. #TideAd was used 45,000 times, with people generating their own #TideAd content memes and even won Twitter’s #BrandBowl. David Harbour is the star of “Stranger Things”, the global sci-fi hit show from Netflix. He also has a cult following on social media. 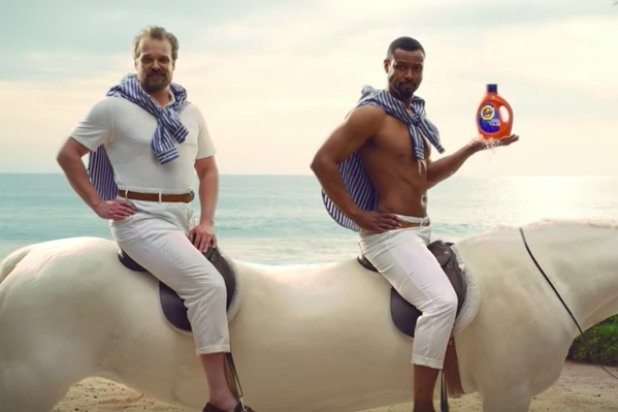 Actor David Harbour sets up the idea that whenever you see clean clothes in a Super Bowl ad, it’s actually a Tide ad. He hijacks ads from other categories like car, beer, perfume, insurance, personal hygiene, cola and even a digital speaker pointing out clean clothes in all of them. Then he invites the audience to keep their eyes open for the next #TideAd.